Piles of plums, peaches, and apricots fill my kitchen’s countertops. Plates with tiny yellow mirabelles and slightly larger greengage plums make it look and smell like a farmers’ market, the fruit flies are having a feast. Every season has its culinary highlights, but late summer is the most lavish time of the year. Figs and berries are at the their peak, packed with sweet juices. 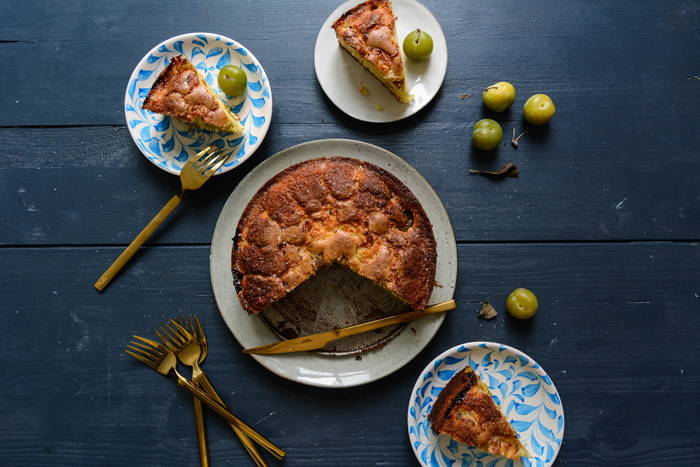 The whole variety of stone fruits is ready to be picked from the trees, and early apples tease me with their sour quality, which is so perfect for baked treats. Sponge cakes, muffins, tarts, and pies are just waiting to be paired with one of these summer fruits – who needs whipped cream or butter cream frosting? 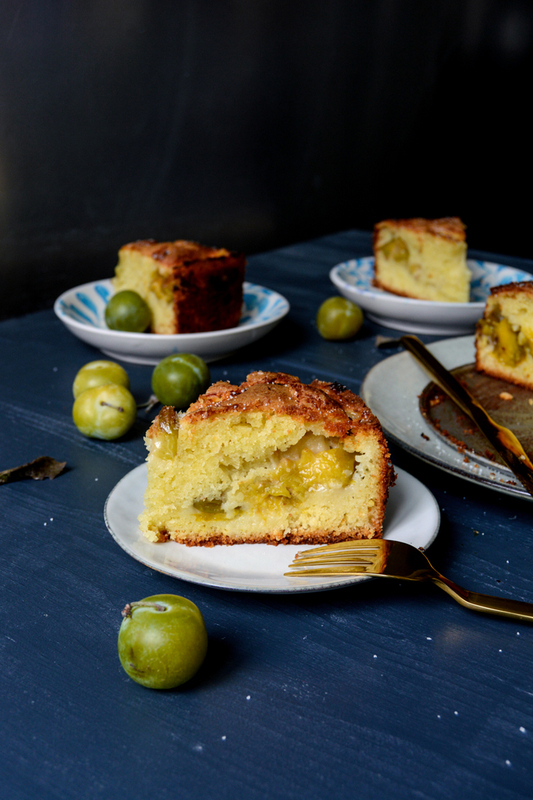 Now is the time to stir some fruit into the dough and enjoy one of the best sweet combinations ever: cake and fruit. Sunday is my favourite day to bake cake. I start the oven right after breakfast, which tends to end rather late. Not so much because we sleep in, it’s more because I enjoy the luxury of not having to rush after a busy week. I take my time, lots of time. Looking at the long tradition of baking in my life, I think there have been two recipes that I have come to use far more often than others, not only on Sundays. The first one is my fluffy German waffle recipe, it’s a family weekend ritual, and the other one is a fruit cake, any kind of fruit cake. It may sound quite simple but there are a million possible variations of this treat: you could add white chocolate, cornstarch for a lighter texture, or put some crumble on top. 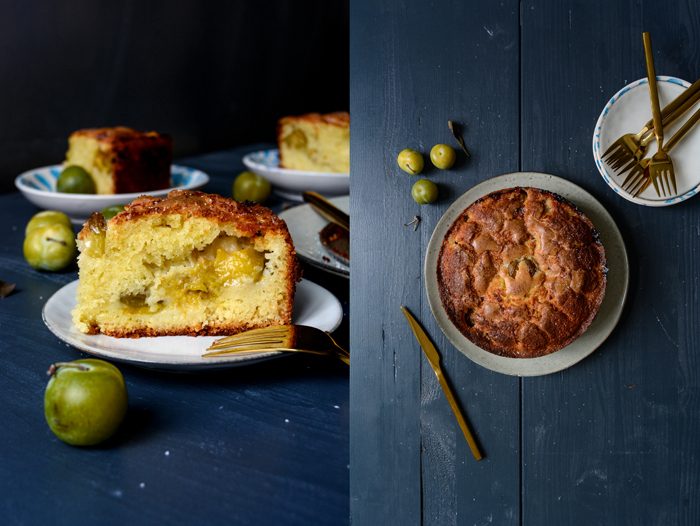 Olive oil creates a warm flavour and adds a juicy texture, great for a cake but also for my fig and ricotta muffins. So here we are, today I went for a classic French yogurt cake, which is usually enjoyed plain. However, my enthusiasm for fruit led to a juicy filling of greengage plums. They were supposed to become a topping, but gravity, in combination with a light sponge dough, had different plans and the fruit sunk. The dairy product is mixed with mild olive oil, no butter (! ), and adds a slightly sour hint. 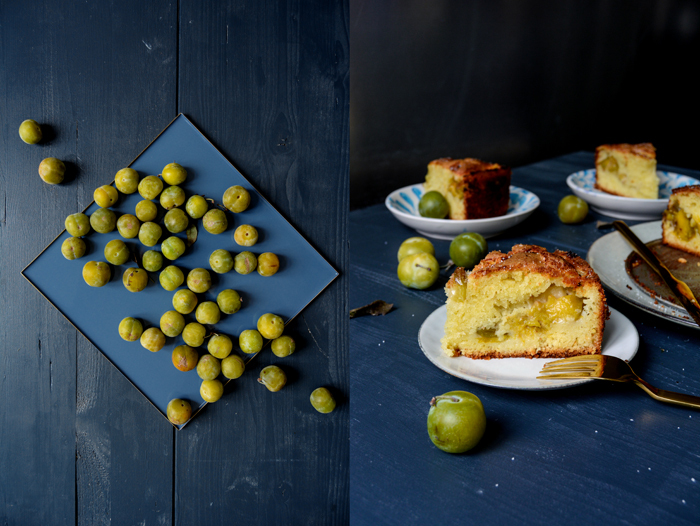 The yellow-green plums make it sweet and fruity, it’s just right for my late summer Sunday. Makes a 20cm / 8″ cake. Preheat the oven to 180°C / 350°F (preferably convection setting). Butter a 20cm / 8″ springform pan. Add the yogurt, olive oil, eggs, sugar, and lemon zest and mix with an electric mixer on low speed for about 1 minute, just until there’s no trace of flour left and the dough is combined. 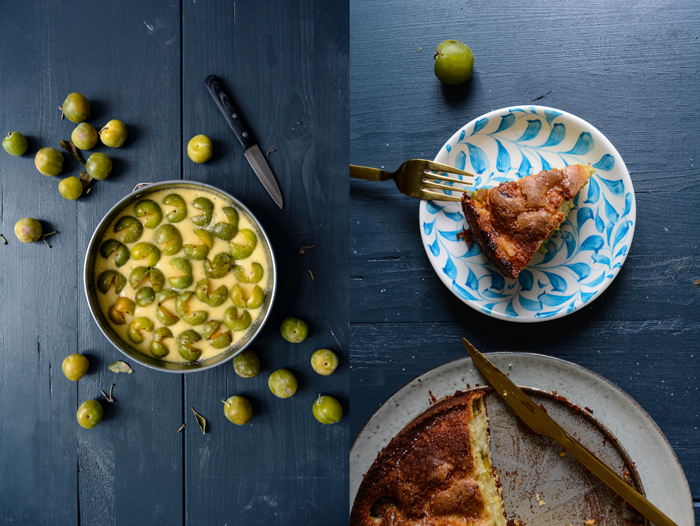 Pour the batter into the prepared pan and arrange the greengage on top of the batter (vertically, see picture above). Sprinkle with the remaining 2 teaspoons of sugar and bake for about 60 minutes (slightly longer if using a conventional oven) or until golden brown on top. If you insert a skewer in the center of the cake, it should come out almost clean. 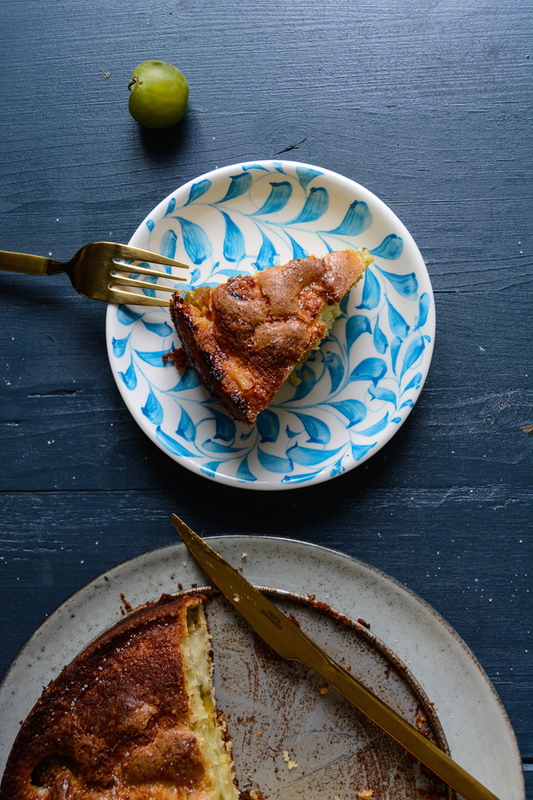 Let the cake cool in the pan for a few minutes before serving. I do not think greengage plums are available in the USA. –I have not seen them here, maybe in NY. city. — and regular plums would be too juicy. I will try apricots, not quite as delicious as ripe greengages or Mirabellen, but they might do. Thanks for a delicious recipe Dorle. Hi Dorle, apricots would definitely work, less juicy and sweeter, but it should taste delicious too, or cherries or figs! Enjoy! 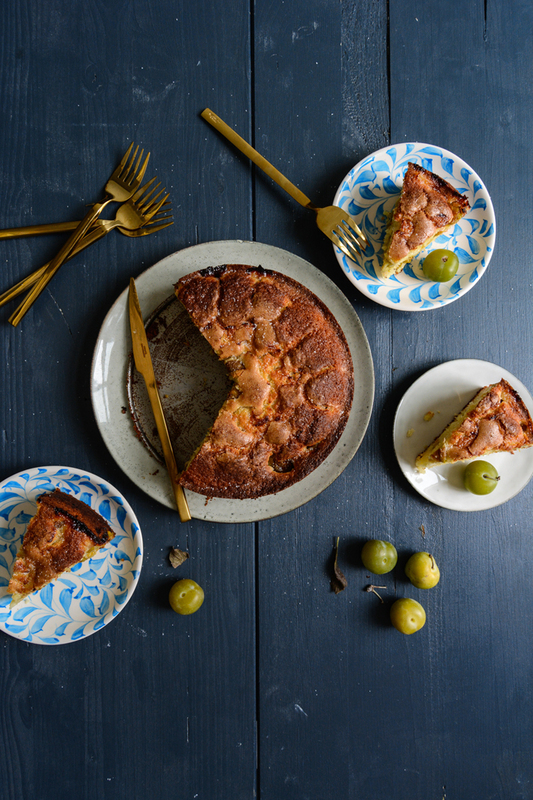 Would this work using gluten free flour and baking powder and soya yoghurt? Hi Jan! I never tried replacing the plain flour and yogurt in this recipe. I’m not an expert when it comes to baking with alternative flours and vegan products, the amounts of the ingredients and baking time might have to change. Enjoy and please tell me how it worked out! I made this cake last night and brought it to my mom for breakfast and we both loved it and already ate the half of it. Sooo scrumptious and tasty. I am not a born baker, but I will try hard to get to this tasty cake. What a beautiful cake, Meike. 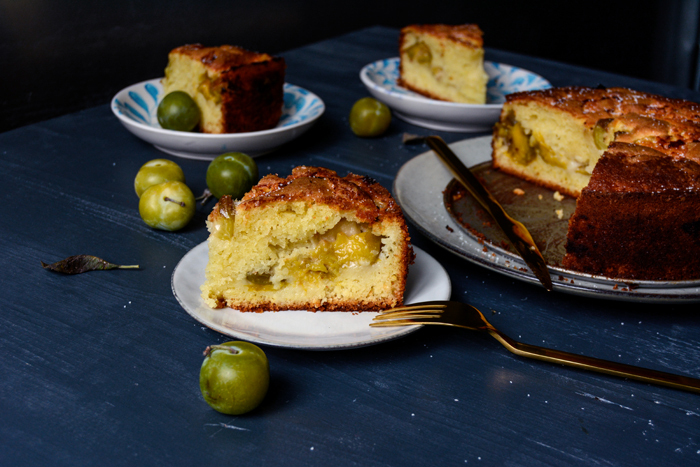 I haven’t seen any greengage plums in the stores this year…hopefully they will arrive soon as I would really like to try this cake.